Reticulum. © 2003 Torsten Bronger. 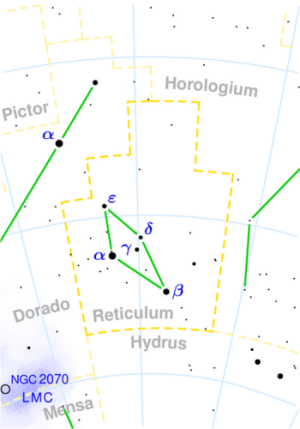 Reticulum (abbreviation: Ret), the Reticule or Cross-hair (of a telescope's eyepiece) is a small, dim, southern constellation lying between Dorado to the northeast, Horologium to the northwest, and Hydrus. One of its few objects of interest to the amateur observer is the wide double, Zeta Ret, consisting of two G stars, similar to the Sun, of magnitudes 5.2 and 5.5 (just visible to the naked eye), lying about 40 light-years away. See below for details of the constellation's brightest stars.